Yes, our team is working in full fledge to bring in some exciting modules that you all are waiting for. Just last week, I introduced the Business Hours module pushed through UABB version 1.9.0. Today, I am happy to announce and introduce to you the most awaited Woo modules – a set of WooCommerce modules that come within the Ultimate Addons for Beaver Builder version 1.10.0! 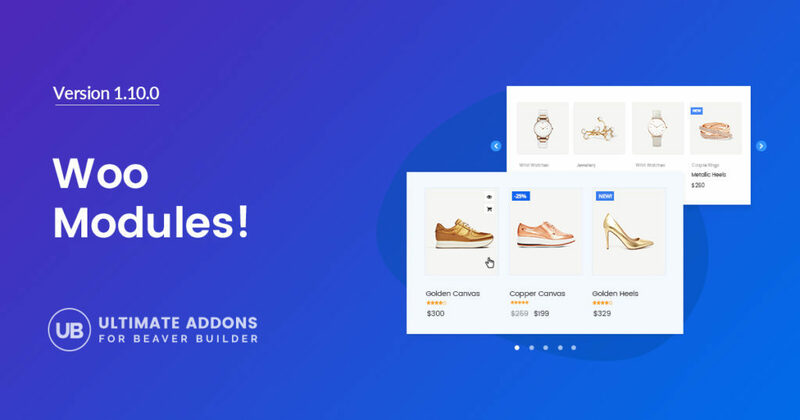 This means that you can now create a beautiful looking online store using the unique and creative modules we offer to display your products and categories on your website. Flaunt your products in style! A WooCommerce store is all about the products you offer. The main purpose of an online store is to flaunt every product and encourage buyers to purchase them right away. The Woo Products module of UABB allows you to display your products in a grid or a carousel layout on your website. You can use the inbuilt Query Builder to sort and filter products while displaying them on page. This module also has the quick view option that gives users a clearer view of the product without moving on to a new page. You can also make use of sales and featured flashes – the highlights that often boost conversions. Having included all of this, we’ve made sure that nothing gets too complicated! It’s as simple as using any other UABB module! Wish to take a look at a few products we listed using this module? You can take a look at the demo page and read more about the Woo Products module. Showcase all your categories in one place! Many times, a purchase decision is hard to take – mainly because buyers do not know what you have in store for them. Proper categorization will let you display all your products under the specific category and also help buyers know what you have in store for them. With the Woo Categories module, you can display all your product categories together with information like the number of products within it, the description and more. UABB’s Woo Categories module also lets you customize and display categories in style. You can add on-hover effects, enhance the design, colors and more. You can take a look at some product categories we’ve displayed on our demo page and read more about the Woo Categories module of UABB. Ease the process of quick buying using the Add-to-cart button! Buyers prefer online stores as they save time. You have everything your buyer wants and display them using the Woo Products module. You even categorize them with the Woo Categories module. This for sure will attract buyers. But what’s more? The action – Making a Purchase! The easier you make this, the faster will he purchase. The Woo Add to Cart button allows you to display an add-to-cart button that adds the product directly into the cart when clicked on. You can manage the look and feel of this button and also define a specific quantity of products you wish to add to the cart. You can take a look at some samples of the Add to cart button on our demos page and read more about this special Woo Add to Cart module. This update is for those who plan to build an online store – one that is beautiful and stylish! I am sure you are going to love this special set of WooCommerce Modules for Beaver Builder, especially when you don’t have to pay a single penny extra for it. You can these along within the Ultimate Addons for Beaver Builder. Its been a couple of hours since we released an update and you should have received an update notification in your WordPress backend. If not, please make sure you have activated the license of the Ultimate Addons and proceed to update the plugin. If you want to take a look to see all that we offer in an update, you can peep into our changelog.